A simple way to calibrate your neural network. A simple way to calibrate your neural network. The temperature_scaling.py module can be easily used to calibrated any trained model. Based on results from On Calibration of Modern Neural Networks. TLDR: Neural networks tend to output overconfident probabilities. Temperature scaling is a post-processing method that fixes it. 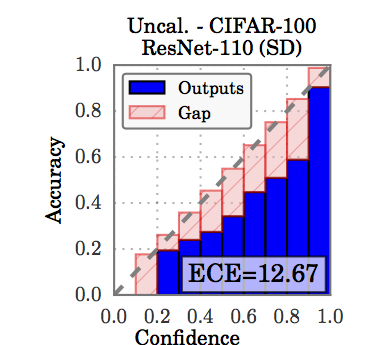 Neural networks output "confidence" scores along with predictions in classification. 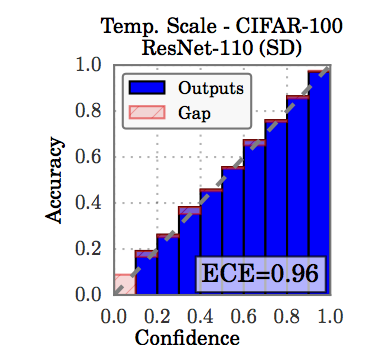 Ideally, these confidence scores should match the true correctness likelihood. For example, if we assign 80% confidence to 100 predictions, then we'd expect that 80% of the predictions are actually correct. If this is the case, we say the network is calibrated. A simple way to visualize calibration is plotting accuracy as a function of confidence. Since confidence should reflect accuracy, we'd like for the plot to be an identity function. If accuracy falls below the main diagonal, then our network is overconfident. This happens to be the case for most neural networks, such as this ResNet trained on CIFAR100. Temperature scaling divides the logits (inputs to the softmax function) by a learned scalar parameter. I.e. where z is the logit, and T is the learned parameter. We learn this parameter on a validation set, where T is chosen to minimize NLL.